Born in 1949, Dench is a native of the Pacific Northwest, where she lives with her husband and two children. Her studio is located in a second-story warehouse space near her home. 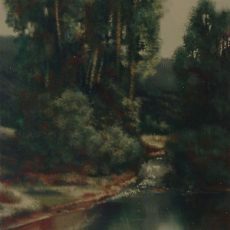 She received her formal education at Whitman College, Western Washington University, and the University of Washington, but she believes she has learned far more in her studio. She has had exhibitions of her artwork in California and New York as well as the Northwest; and her works are currently part of many corporate and private collections, including Allstate, the Boeing Company, Holland America Cruise Lines, Microsoft, Restii Corporation, Mitsubishi Corporation, and Nordstrom. A renegade in respect to the belief that an artist should stick to one medium only, Dench's artistic explorations have involved oil and acrylics, pastels, monoprints of every conceivable description, rock stamping, woodcut printing, and since late 1992, she has been building and learning to use a computerized art studio. My computer Olivia, my digitizing tablet Juliet, the stylus that is my brush, and my external hard drive Anita continue to amaze me, she says. When one hears the term 'computer supported,' it tends to convey the notion of a mechanical process: make a list, give me three rocks, two trees, and a landscape. In truth, using a computer screen in place of a canvas is a medium much like any other, having its own applications, limitations, and levels of mastery. The artistic process is still there and, in fact, is even more challenged by the experimental nature of computers and art. In Dench's case obstacles and the unknown have been surmounted, for she has brilliantly succeeded in creating still life paintings with a tranquil, 19th-century look that belie the fact that computer technology is among the artistic resources used to create these beautiful mixed media images. 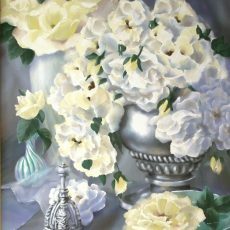 With her experience as a traditional fine art painter and the support of the newest computer technology, Dench has produced work that is as astounding and fascinating as it is alluring in its artistry and beauty. The many hours of work and refinement that go into the final product speak of her multiplicity of talents. Dench seeks through her work to elevate the dark and the downcast, to use the beauty that is intrinsic to reality as an antidote against the things that are less than beautiful. We all know that there is ugliness and pain in the world. If my work encouraged you to dwell on those things, I would only be increasing the negative power of those things, an outcome which I do not want. To create a sense of wholeness, therefore, an awareness of beauty, and peace in its most dynamic sense - these are the goals of my art at its best.